Since our team are sorted into different groups, we are focusing on constructing the Effector Cell. Totally, we should build 3 different effector cells to fulfill our project. In detail, we make use of the following biobricks to construct the effector cells. They are pLas (BBa_R0079), Constitutive Promoter (BBa_J23106), pLas/lux (BBa_K091146), RBS (BBa_B0034), RFP (BBa_E1010), amilCP (BBa_K592009), cjBlue (BBa_K592011), LasR (BBa_C0079), DT (BBa_B0015). 1. We transformed the plasmids (BBa_R0079, BBa_J23106, BBa_K091146, BBa_B0034, BBa_E1010, BBa_K592009, BBa_K592011, BBa_C0079, BBa_B0015) to amplify them. 2. We extracted the plasmids (mentioned above) and did the electrophoresis to test the quality and concentration of them. Note: Different concentrations are from different tubes. 1. We picked up colonies from the plates made last time and did the liquid culture of bacteria that contain the plasmid (mentioned above). 2. We stored the bacteria that contain plasmids (mentioned above) with glycerol in -80℃. 3. We extracted the plasmids again. 4. We cleaved the plasmids (BBa_B0034 and BBa_K592011) in 37℃. 1. For plasmids prep, the concentration was too low and we discarded them. 2. For cleavage, there was no line appearing on gel. 1. We transformed BBa_I71204, BBa_I1466, BBa_K575014, BBa_J23100, BBa_I718013, BBa_K592025, BBa_S03156, BBa_I13401, BBa_C0171 plasmids into E.Coli and extracted the plasmids. 2. We cleaved the plasmids mentioned above by the EcoR I and Spe I (BBa_I13401, BBa_S03156, BBa_B0015, BBa_I1466, BBa_K592025) or Xba I and Pst I (BBa_J23100, BBa_C0171, BBa_K575014). 3. We tested our cleavage products by electrophoresis. 2. 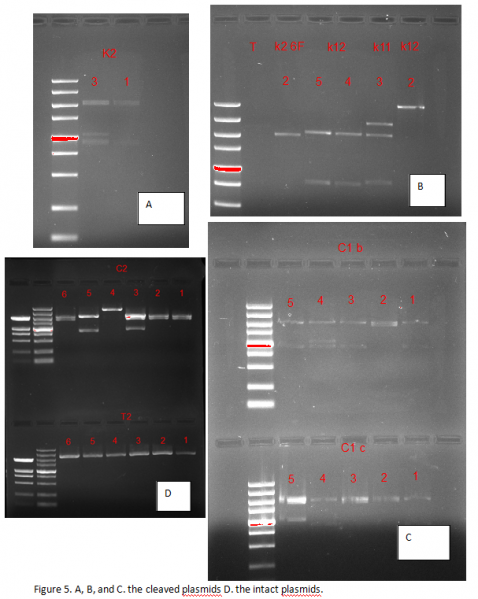 The electrophoresis result is shown in Figure 1. 1. We cleaved the backbones with Kanamycin and Ampicillin resistance. 2. We linked the biobricks with our backbones via 3A assembly. In detail, we linked the BBa_B0015 and BBa_C0171 with pSB1A3 (named A1); the BBa_B0015 and BBa_K575014 with pSB1A3 (A2); the BBa_S03156 and BBa_J23100 with pSB1K3 (K1); and the BBa_I1466 and BBa_J23100 with pSB1K3 (K2). 3. We transformed our linkage products into E.coli. and did the liquid culture to amplify the products. And then we extracted the plasmids which are tested by cleavage and electrophoresis. 4. We cleaved the pSB1C3 serving as the backbones to link A2 with K2 (C1) and A1 with K1 (C2). 5. We linked the BBa_K592025 and BBa_B0015 with pSB1A3 (A3). 6. We cleaved BBa_K592025 and BBa_B0015. 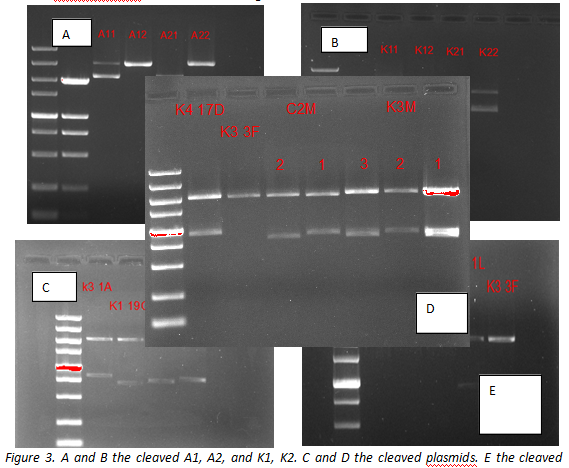 2.The electrophoresis result is shown in Figure 2. Figure 2. A the cleaved backbones (pSB1K3 and pSB1A). B and C the cleaved plasmids. 1. We linked the BBa_K592025 and BBa_B0015 with pSB1A3 (Named Li3). 2. We transformed the BBa_K608002, BBa_K082035, and Li3. 3. We cleaved A1, A2, K1, K2 to test their qualities. 4. We did the liquid culture of C1, BBa_K608002, BBa_K082035, K3, C2, BBa_I1466, BBa_B0015, and BBa_J23100 and extracted these plasmids and tested the quality of C1 by cleavage and electrophoresis. 5. We cleaved K1, A3, BBa_J23100, BBa_K575014, and BBa_C0171 with EcoR I and Spe I; A1; BBa_K608002, BBa_S03156, BBa_B0015, BBa_I1466, and BBa_K592025 with Xba I and Pst I . 6. We linked the K1 and A1 with pSB1C3 (C2), A2 and K2 with pSB1C3 (C1), A3 and BBa_K608002 with pSB1K3 (K3), BBa_B0015 and BBa_C0171 with pSB1A3 (named A1); the BBa_B0015 and BBa_K575014 with pSB1A3 (A2); the BBa_S03156 and BBa_J23100 with pSB1K3 (K1); and the BBa_I1466 and BBa_J23100 with pSB1K3 (K2) and then we transformed them to extract the plasmids and tested them by cleavage. 7. We prepared the pSB1K3, pSB1A3, and pSB1C3 by EcoR I and Pst I. 1. The electrophoresis result is shown in Figure 3. Figure 3. A and B the cleaved A1, A2, and K1, K2. C and D the cleaved plasmids. E the cleaved backbones and plasmids. 2. We linked the A2 and K2 with pSB1C3 (C1), the BBa_R0040and BBa_S03156 with pSB1A3 (A4 and A5), the K1 and A1 with pSB1T3 (T2), the K1 and A1 with pSB1C3 (C2). And then we transformed them to extract the plasmids. 3. We extracted C1 plasmids and tested them with cleavage. 4. We transformed BBa_K575037 and BBa_K575039 to extract the plasmids. 5. We linked BBa_K575037, BBa_K575039 with CP, Blu, R, and C2 respectively. 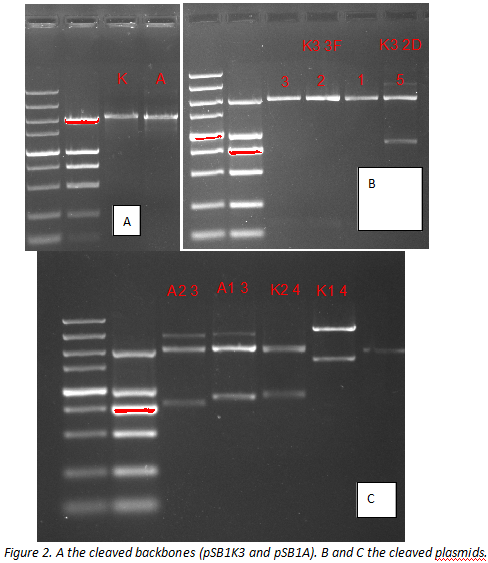 he electrophoresis result is shown in Figure 4. Figure 5. A, B, and C. the cleaved plasmids D. the intact plasmids.